This week, our Realtors Chris Romberg and Robert Bell discovered a gem on Atlanta Highway with some of the freshest and most delicious authentic Mexican cuisine they have tried! Los Carillos II is part Hispanic grocery store with fresh fruit, vegetables, meats and more! The restaurant specializes in traditional Hispanic dishes, tacos and more. Chris and Robert tried a dish that was a combination of grilled chicken, skirt steak, chorizo, onion, tomato, Mexican cheese, jalapeno, cactus and cheese quesadillas–all served in a steaming verde sauce! Chris said the homemade salsa was some of the freshest he’s ever tasted. 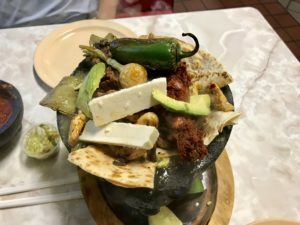 If you have been to Los Carillos II please let us know and leave us a comment on your favorite dish.